When it comes to cleaning up after working with paint, oil, grease, tar and other types of tough grime encountered in industrial settings, your hand wash needs to be equally tough. Regular soap isn’t designed to handle oily substances and doesn’t always penetrate the grime left in hands’ creases and crevices. Washing too often, too vigorously, or with cleaners that contain harsh chemicals can dry out and damage skin. 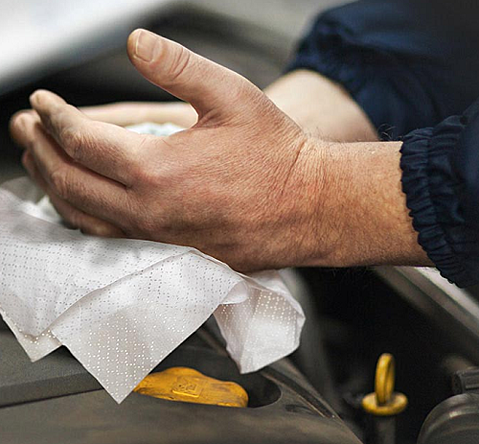 Mechanics often develop chronically dry, cracked skin on their hands due to the substances they work with and the amount of washing it takes to remove it. So how do you clean your hands at work but also keep skin healthy and moisturized? Many different types of hand cleaners and wipes have been developed to address this problem. You may have seen heavy duty, industrial hand wash on the shelves that contain small pieces of pumice (a volcanic rock) as a scrubbing agent. Pumice may be effective at scrubbing away stubborn messes, but it can also damage skin by creating tiny micro-abrasions, leaving hands feeling rough and dry. Cleaners that contain pumice can also be harmful to the environment by clogging drains and septic systems. In the past, plastic microbeads were used as a less abrasive scrubbing alternative, but these beads can also find their way into waterways and be eaten by fish and other wildlife, leading their production and sale to be banned federally in the Microbead-Free Waters Act of 2015. Petroleum distillates and solvents are another type of cleansing agent that are commonly added to industrial hand cleaners. These solvents are derived from crude oil and can be highly effective at penetrating grease and grime – however, they can also dehydrate the skin, cause contact dermatitis, and are potentially carcinogenic. Companies are increasingly limiting or removing petroleum solvents from their cleansers for these reasons. Some cleaners that still contain these substances are not even allowed to be sold or shipped into California. As an alternative, choose a petroleum-free cleaner with biodegradable scrubbing agents like walnut shell, corn or olive pits. Gasoila’s Tub O’ Scrub Heavy Duty Hand Cleaner is walnut shell-based and contains no pumice or petroleum solvents. The small, fully sanitized pieces of walnut shell are less abrasive than pumice and wash away in the drain without clogging. Tub O’ Scrub also contains aloe vera, lanolin and Vitamin E to keep hands soft and moisturized through repeated washing. Dry, damaged skin is an unsightly, uncomfortable problem that can even cause downtime for workers in industrial environments. No one wants their hands to constantly be rough and cracked, not even the “tough” mechanics who deal with oil and grime on a daily basis. Hard-working hand cleaners and wipes that aren’t too abrasive and contain moisturizing agents can make a significant difference without being a costly investment.